There were 479 press releases posted in the last 24 hours and 153,740 in the last 365 days. BOSTON, April 17, 2019 (GLOBE NEWSWIRE) -- AliGo Mobile has launched a new service that uses a classic Airstream trailer to deliver beautiful smiles to consumers at their workplaces. AliGo Mobile visits local businesses and office parks to provide onsite Invisalign® consultation, care and management, making it quick and convenient to access high-quality orthodontic care. /EIN News/ -- Sixty-five percent of all adults could benefit from orthodontic treatment. Orthodontics not only improve the appearance of smiles, but also help address bite issues, TMJ symptoms, and make teeth easier to clean, reducing potential cavities and gum disease. While more and more adults are addressing their smile concerns, carving out time for regular follow up office visits (usually every 6-8 weeks) can be problematic. The AliGo Mobile team provides complete Invisalign treatment and follow up care in its Airstream trailer (complete with waiting and exam rooms) parked in your office parking lot. Treatment includes a complimentary Invisalign consultation using an impressionless 3D scanner, bi-monthly monitoring of treatment progress, and complimentary tooth whitening given to patients with their retainers at the end of treatment. Aligners are hand-delivered to patients, and AliGo Mobile offers flexible payment options, including FSA and HSA. There is no cost to businesses that host AliGo Mobile, making the service an easy additional health and wellness benefit that they can offer to employees. "Working with AliGo Mobile has been simple, easy, and effective,” said Erin Tremblay, Event Specialist for Longfellow Real Estate Partners. “We are so thankful to be able to offer our tenants a convenient, high quality service that promotes well-being. We aim to make our tenants' lives easier and more convenient, that way they can leave work and spend their free time doing the things they love." 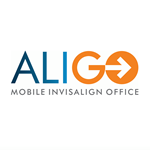 AliGo Mobile is a mobile orthodontic office specializing in Invisalign treatment. The team coordinates visits to local businesses and office parks to provide orthodontic care directly to consumers. AliGo Mobile helps companies deliver an important employee benefit and saves employees both time and money, while helping them look and feel their best. Connect with AliGo Mobile on Instagram, Twitter and Facebook.